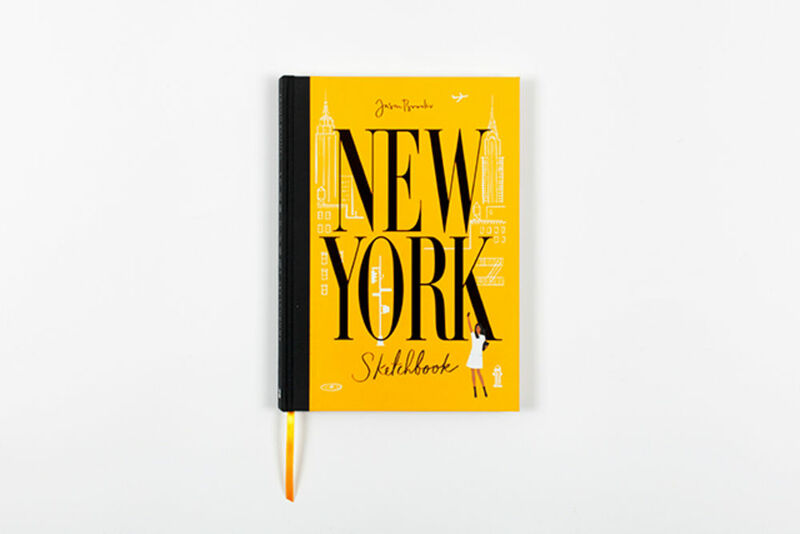 My latest book, New York Sketchbook, aims to bring the city to life through over 200 colour illustrations and artworks. It functions partly as a guide book, with an edit of selected places to experience, and partly as a travel journal documenting my responses to the city. I hope it will also inspire readers to go and explore with a sketchbook and art materials themselves. 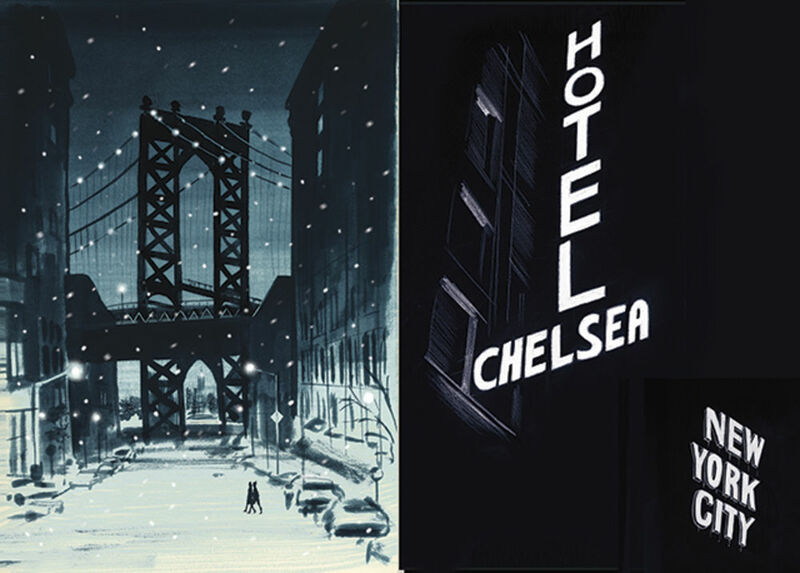 The book was created through a process of drawing on location through all four seasons, relishing New York's atmosphere, glamour and distinctive style. It's the third book in a series following on from Paris Sketchbook and London Sketchbook, which won the V&A Museum's Book Illustration Award in 2016. Each book is created using a combination of media including collage, pencil, paint, ink and Photoshop to create the artwork and page layouts. 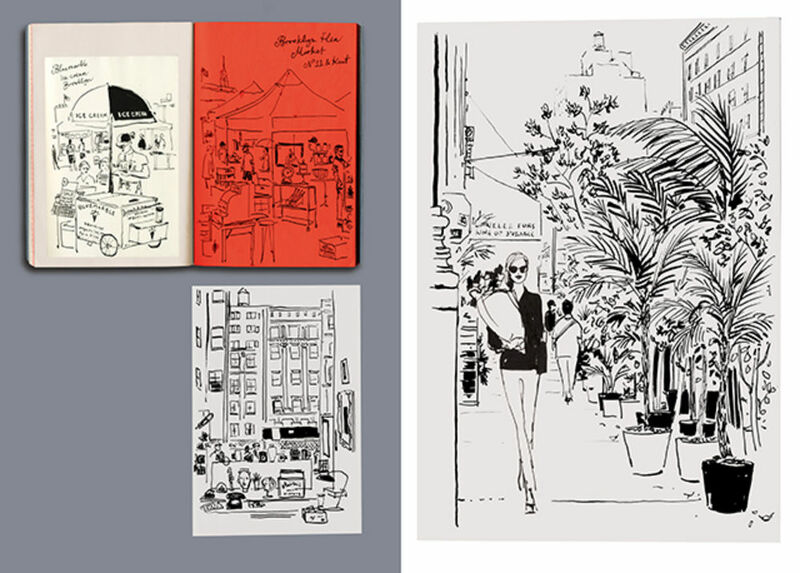 For New York as with all my 'city sketchbooks' the emphasis is on authenticity and reportage first, followed by a dose of artistic imagination. I write all the text and nothing is included unless I have personally experienced it. My goal is to transport the reader, visitor to the city, or 'armchair traveller' on an enjoyable tour of the Big Apple. No understanding of New York is complete without appreciating the role of people arriving from distant shores. At the Tenement Museum, 103 Orchard Street the visitor gets a real sense of what life was like for some in the early years on the Lower East Side. Access is provided by a guide in small groups and you need to book at minimum a few hours in advance. Once inside, the building is presented in its raw and authentic state, almost as if the occupants from 1910's New York have just stepped out. The details are exquisite –cramped kitchen areas with packaging and paraphernalia of the period, a small bed with sagging ticking striped mattress and faded bedspread, a floral dress on a hanger against a wall and treasured family photographs framed against peeling walls. On my visit a young woman in our group passed out and went crashing into an arrangement of pots and pans, emphasising just how cramped and stifling conditions must have been when whole families shared these modest rooms. With a little imagination and time to take it all in, the experience of visiting the Tenement Museum conjures up the flashback scenes in Scorcese's Godfather II, where Vito Corleone strives to make a life for his young family. It also makes you see the surrounding neighbourhood in a different way and appreciate how the continuing story of immigration in New York is so central to its identity. 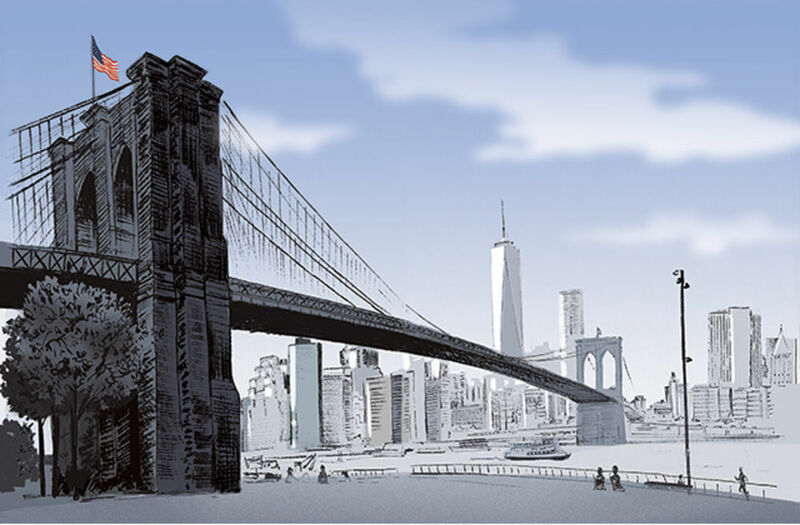 In New York Sketchbook I talk about the constant sense of a dialogue in the city between natural forces and the manmade. A living demonstration of this is Central Park itself, a huge green rectangle containing around 26,000 trees and bordered on all sides by honking traffic, towering buildings and the city's imposed grid of streets and avenues. At the intersection of both forces, gnarled and twisting tree roots tear up sections of the sidewalk as if symbolising the struggle for supremacy. My favourite views in the park grandly display its trees and rocky outcrops in the foreground against the cliff-like buildings and towers behind. 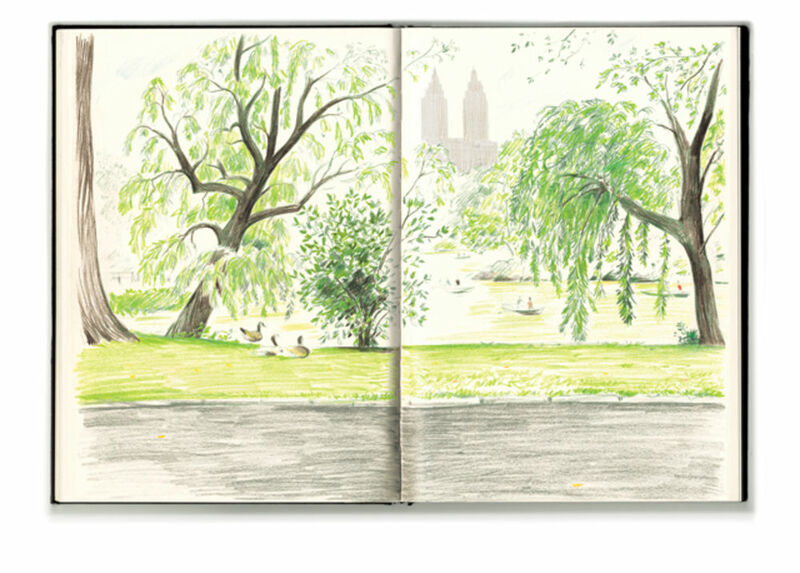 One of these views, across the boating pond toward the San Remo building features on p.44 of New York Sketchbook. Making the drawing involved sitting perched on a rock with an open double page of an A4 sketchbook and a handful of coloured pencils, as time passed and the gentle pace of parklife swirled and unfolded around me. Toward the southern end of the park there are fantastic views of the buildings of mid town behind the trees, and from the rooftop bar of the Met Museum you can take in the whole tree top canopy. I love markets of all kinds and have visited them from Guatemala to Instanbul. New York has several worth mentioning including the Hell's Kitchen Flea Market and Chelsea Flower Market, but my current favourite is the Brooklyn Flea Market that happens every weekend between N11 and Kent. The stalls display everything from vintage graphic ephemera, to furniture, clothing and eccentric objects of all kinds. It's a fascinating insight into the daily lives of New Yorkers stretching back over decades. Handling maps and bus tickets from Mad Men era New York and bringing back treasures that are completely unique is evocative and fascinating, and the whole experience is like a living museum where the most choice artefacts are available to buy. Brooklyn Flea can be reached in 25 minutes from midtown Manhattan by subway. Don't miss views of the Brooklyn Bridge and Manhattan from Brooklyn Bridge Park, and the iconic view of the distant empire state building on Washington Street that featured in Once upon a Time in America. 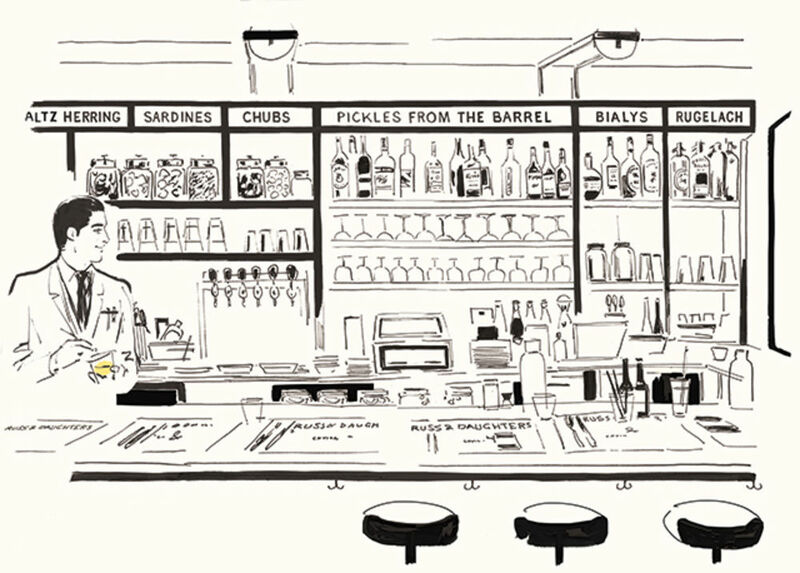 Nearby Marlowe and Sons at 81 Broadway is a great place for lunch. This 100 year-old deli at 179 East Houston Street epitomises something very authentic and beautiful about New York that's apparent not only in the fantastic food on offer, but also in the conversations you will overhear when waiting in line- for what might well be the best smoked salmon and cream cheese bagel you will find anywhere. For anyone with an ear for dialogue the exchanges between customers and staff are a scriptwriters dream, Russ's seems to attract irresistible characters who have lived here forever, and communicate with a certain directness, charm, dry humour and jovial New York sass. The same can be said of nearby Russ and Daughter's Cafe, its relatively recent sister restaurant at 127 Orchard Street which is also fantastic. Hidden in plain sight, the Empire State Building is worth appreciating and celebrating despite its status as one of the most obvious architectural symbols of New York. Rather like Hokusai's views of Mount Fuji, I love catching sight of it unexpectedly (try the reflection in the flower shop window at 106 West 28th Street), or across the water from the Brooklyn ferry that runs back and forth across the East River. My favourite room at the Nomad Hotel on Broadway has an incredible view that fills the window and changes with the light through the day and night like one of Monet's haystacks. 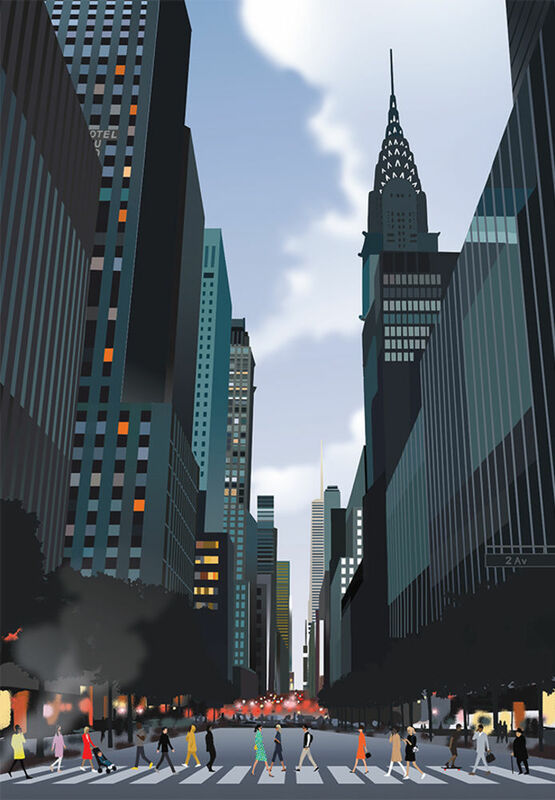 At street level its scale is astounding and the view I chose to draw it from on p.37 of New York Sketchbook, from 34th Street as you approach 5th Avenue is as breathtaking as any. Making the drawing involved getting as low down as I could in order to fit in all 443 metres to its summit on the right hand page of a DPS. 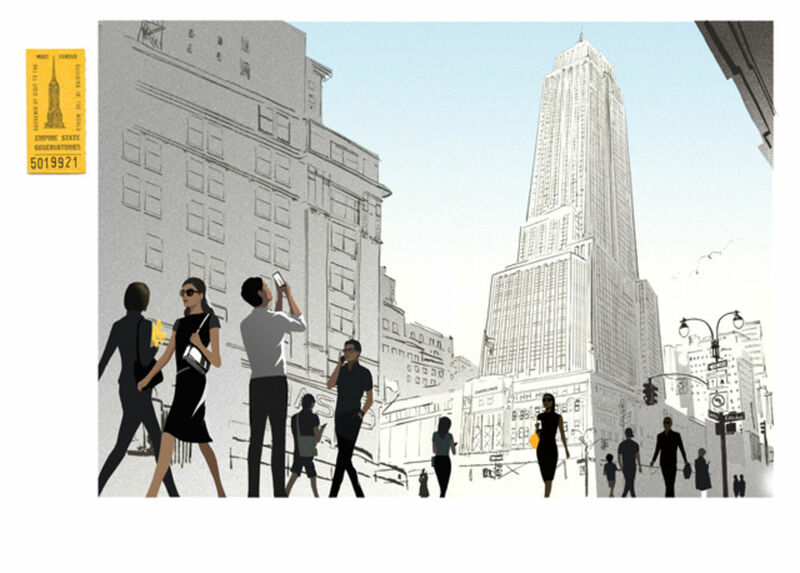 I also included people passing me on the street in my drawing for atmosphere and scale. At the foot of the building on the right hand page; I also included a self-portrait of me walking with my son Tom.